Samuel shook his head, eyeing the imposing lineup of Jesse’s boys. Tall, good looking, and probably good warriors, he figured. Why does the Lord always have to pick the low enders? He smiled. He himself was a bit of an unlikely choice too, come to think of it. If it hadn’t been for his mom’s crazy vow, he might have been a normal kid instead of growing up in the tabernacle cleaning linen and hauling water for old Eli. You know what happened. 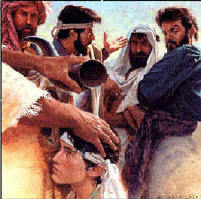 David’s brothers must have been a little miffed that little brother David was anointed king instead of one of them. Maybe they felt a little like the sons of Jacob, who resented the way their dad made over spoiled little Joseph as if the older kids were little more than glorified ranch hands. It was no different with Jesus. How can somebody you grew up with, somebody you might have watched grow up, somebody whose habits and idiosyncrasies often got on your nerves, suddenly start acting as though he thought he was somebody? Just who in Galilee does this guy think he is? So Jesus said his famous line: “A prophet is not without honor except in his own town, among his relatives and in his own home” (Mark 6:4). You might not remember it quite like that, but don’t forget the King James Version is nearly twice as old as the United States; a little modern English is good for the soul. Jesus said it in Aramaic, anyway, and none of us would make that out, even if we’ve studied it, because understanding someone’s pronunciation from 2,000 years ago is different from reading it today. But we digress. The lesson we’re drawing out of this passage is that we’re a whole lot more enamored with impressive strangers than we are with the people we already know all too well. That helps account for sexual affairs, you know. It’s all in the mystery. If you really knew the goofball you were shacking up with for the night the way his or her relatives and friends do, you’d stay a million miles away. But alas, we have more respect for people we don’t even know than for those we do. It was in Nazareth, where Jesus grew up, that he could heal only a few people. Why? Because they didn’t believe he could possibly be a healer. They could not accept one of their own as being somehow greater than they were, even if it meant foregoing the healing he could have brought them. Faith and humility don’t travel without each other. Trusting Jesus means seeing yourself in need of him. Knowing your need for him generates trust in him. He’s in town, your town, right now. Trust him with your burdens. Let him give you rest. It’s you he’s come to see. The first time Jesus sent out the disciples, he gave them some pretty specific instructions: Go two by two, take a staff (presumably a shepherd-style staff, not an office staff), but don’t take anything else — no food, no satchel, no money. Wear sandals, but don’t take a change of clothes. When you get to a town, stay in the first house you enter until you leave that town. And if anybody doesn’t welcome you or listen to you, shake the dust off your feet on your way out of town. Strange stuff. Apparently they followed the instructions, and apparently they had a good trip — they drove out a lot of demons and healed a lot of sick people by anointing them with oil. But why the unusual instructions? Some people think those instructions should still be followed today. Not many people, thank God, but there are some who prey on unsuspecting generous people, citing this passage as their badge of authority to move in and leech off somebody by masquerading as a “servant of God.” Don’t listen to such people—they’re con artists, not evangelists or prophets or whatever else they might call themselves. So what did Jesus have in mind with these strange rules for this first “disciplic” excursion? Mark is brief, just giving the facts, but not the background. His first readers probably knew what was behind these instructions, but a couple of thousand years down the road we have to piece it together from what we know of the religious and social customs of first century Judea. The command to go two by two might reflect Deuteronomy 17:6 and 19:15, where Israel was taught that at least two witnesses were needed to establish the truth of a matter — in this case, the veracity of Jesus’ ministry. They were to take no food, satchel or money. It might be that Jesus simply wanted to illustrate the fact that his followers were to trust God for their needs. Or it might be that he wanted to show that his followers were not like certain speakers of the day who traveled into towns with a collection bag to gather money. Or maybe the idea is that they were to travel light to symbolize the urgency of their mission. Beyond that, it gets pretty murky. They were to take a staff, or walking stick. We could invent a meaning for the walking stick, but it would be our invention. For example, we could say that the disciples would be shepherds of the flock one day, and the staff symbolizes that. But we would be guessing. Why sandals? We’re not told. The shaking of dust from the feet might be easier to understand. According to tradition, when a Jew returned to Judea from visiting a foreign country, he was to shake the dust off his feet, thereby keeping the land unpolluted from the dust of gentile lands. The disciples were to shake the dust off their feet as a witness against any Jewish towns that refused them, maybe symbolizing that such a town was cutting itself off from Israel by refusing Jesus. Whatever the reasons behind them, these instructions were not intended to be the norm for all mission style work from then on. They were unique instructions for a unique band of men on a unique mission, unique even for them. The commands were specific to that particular mission, and they probably had something to do with presenting a symbolic testimony to Jesus as Messiah, even though we’re not directly told that. The Bible is full of instructions that we should follow, but it is also full of stories about instructions that were given to particular people for particular reasons in their particular times. Naaman, an Aramaic general who suffered from leprosy, was told by Elisha the prophet to dip in the Jordan River seven times to cure the disease (2 Kings 5). Should we go jump in the river to heal our skin problems? The Israelites were told to go outside the camp with a shovel to relieve themselves (Deuteronomy 23:12-13). Should we avoid toilets and drive out of town when we need to relieve ourselves? It’s a good idea to look at the principles behind a particular instruction as a way of helping us determine whether and how to apply that instruction to ourselves in our day. Some biblical instructions might not apply to us at all. Others might need to be applied in ways that are appropriate for our day and circumstances, rather than the specific ways they were applied in biblical stories. Jesus said that what marks us as his true disciples is that we love one another (John 13:35). Now there’s an instruction that means exactly the same thing today as it did when it was first given. Wouldn’t it be great if we gave that one the most attention?